If It's Too Loud...: Mr. Lif & Brass Menazeri - "Crypt of Lost Styles"
Way back in 2011, Mr. Lif was invited to play the Seattle Folk Festival. (It might seem like an odd venue for him, but for those of us who've been following Mr. Lif for a while, it makes perfect sense. Also, how aren't more folk festivals booking hip hop artists by now?) He didn't have a backing band, so he was paired up with Brass Menazeri, San Francisco's original Balkan Brass Band. It went so well that they've all joined up for an album coming out next month. "Crypt of Lost Styles" is virtually perfect. For decades, hip hop artists have been sampling horns, and now Mr. Lif has the energy of a live brass section behind him. It's a sound that's completely obvious in how perfect it all melds, but hasn't really been done before. It's pure old school hip hop through this glorious new prism that feels familiar even though it's completely fresh. You can listen to "Crypt of Lost Styles" below. 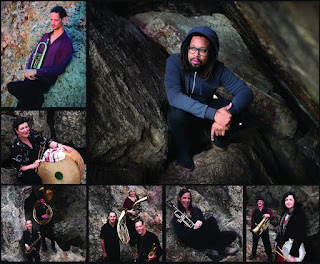 Mr. Lif & Brass Menazeri's album, Resilient, will be out on November 3 via Waxsimile. For more on Mr. Lif, check out his website. For Brass Menazeri, check out their Bandcamp. And let's all hope for a collaborative tour.